Although most people associated a pinched nerve with the neck, it is actually more common in the back, and can radiate to the arms and legs as well. A pinched nerve is a common cause of on-the-job injury. How can you successfully treat my pinched (or trapped) nerves? Treatment for pinched nerves depends upon the cause of the disorder. If the nerve is affected by joint dysfunction or subluxation (misalignment) of bone, chiropractic adjustment is the treatment of choice, and often results in immediate pain relief. Disc injury requires additional intervention, including traction to elongate the spine and reduce pressure on the disc. Chiropractic traction techniques can relax muscles spasms and give the nerve some breathing room. 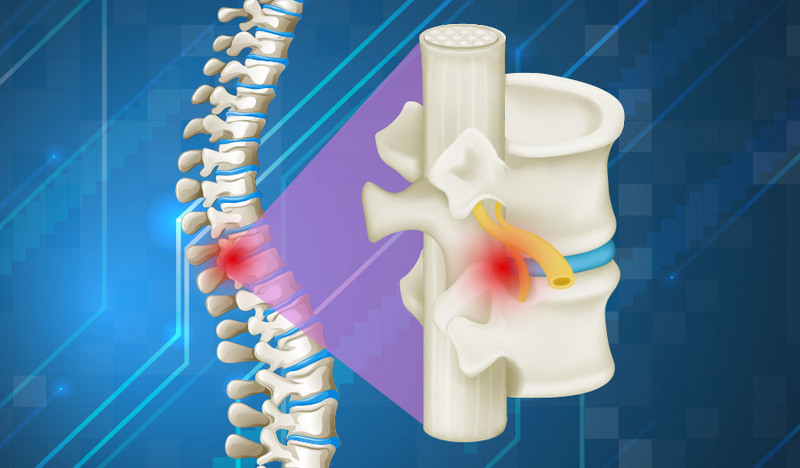 This type of traction is infinitely preferable to surgical intervention, and actually allows spinal discs to fill with fluid, which takes pressure off spinal nerves. Trapped nerves are nerves that become irritated as they pass through muscles, often referred to as peripheral nerve entrapment. When damage occurs to these nerves and their protective myelin sheaths, scar tissue is laid down which leads to adhesions between the sheath and the nerve. Treatment for this type of nerve injury involves a procedure called Active Release Technique, or ART. It is accomplished by applying pressure with a thumb or finger at the adhesion site while moving the body part through complete range of motion exercises, thus pulling the nerve away and separating it from the adhesion, often resulting in often immediate relief. Additionally, The Butler Spine Program is a breakthrough non-surgical treatment using the LCT 1000 Deep Tissue (Class IV) Laser and spinal decompression that has proven effective in relieving the pain of pinched and trapped nerves. What are the symptoms of pinched nerves? Pinched nerves occur when nerves are irritated, inflamed, or damaged, either by impingement between two spinal bones, pressed upon by a bulging disc, or encroached upon by bony overgrowth. Nerves can also become “stuck” to muscles, ligaments, or fascia due to repetitive motion injuries – this is known as a “trapped nerve.” Some common causes include injury, poor posture, rheumatoid or wrist arthritis, stress from repetitive work or motion, sports activities, and obesity. Your chiropractor will determine which of these is causing your symptoms and to design a program of treatment to relieve your pain.